These are from the 1973 Star & Style Annual. Hema is on the cover. None of the above are still married, but Amitabh and Jaya are. I can only imagine the media feeding frenzy that this many celebrity weddings in one year would engender today. Posted on August 23, 2008 at 7:05 pm in Hindi movies, Vintage Bollywood images	| RSS feed You can skip to the end and leave a reply. Tanuja looks pretty as ever! Totally love her. Even more than Kajol. Oh, how I used to wait for the Star and Style annuals, and the Stardust one too. Great photos. I didn’t realize all of them got married in the same year. Perhaps, today, the media would have been able to persuade them to space out the events to maximize TRPs. :) And for an appropriate price they may have agreed. Wow, some great pics! I never saw Shomu Mukherjee either but he looks a lot like his brother Deb, but a bit chubbier in the face. That Rajesh-Dimple pic is just scary, IMO. The Gulzar-Rakhee pic is cute, the way they’re looking at each other. Thanks for sharing. Kashmira: was watching a Rajesh/Tanuja film last night and thinking how pretty she is. I originally thought of her as Nutan’s less pretty sister, but she’s actually just as beautiful in a different way. Banno: next time I visit Chor Bazaar I am going to comb it for old filmi mags. Did you keep any of yours? and yes—four superstar weddings in one year would pretty much cause some sort of media meltdown these days. Sy: he does look a bit like Deb…Gulzar and Rakhee made a beautiful pair, I agree. I am also a great fan of Tanuja. She won my heart with her feisty, adorable role *Jewel Thief* (one with a real character arc, too – the character grows up a lot over the course of the film) and ever since I just have a great big soft spot for her every time I see her. Thanks for the terrific pictures, Greta. Carla: She is a feisty character—apparently that was her rep in real life too. Imagine that! Hey Memsaab, thanks for sharing the pics. You know how you said you wanted to see how Kajol’s father looked like, I had always wanted to see a pic of Rakhee & Gulzar together.. so your post was a pleasant surprise! Hema’s 1st pic is absolutely gorgeous. She somehow reminded me in this picture of Raima Sen.. who is the grand-daughter of another gorgeous beauty herself! Actually Ranya, I had always wanted to see what Gulzar looked like when Rakhee married him. I can see why she did! Jaya coming soon, I promise! Rakhee and Gulzar made a really gorgeous couple. Thinking about your scenario of what would happen if all these celebrity weddings were to take place in 2008, all I can think about is those silly names they insist on coining each time two celebrities get together (Jennifer Lopez and Ben Affleack have a lot to answer for) – we’d be enjoying/enduring gems like Rakhzar/Gulzee, Jayatabh/Amitjaya (I quite like those actually) and Dimpraj or something… hilarious. Oh lord! thank goodness we (and they) were spared all of that! :-) Hilarious. Thanks for posting these, I didn’t know half of these couples were ever together! Boy, Kajol looks a lot like her mother, doesn’t she? Thanks for posting. I always wondered about what Kajol’s papa looked like too. Dimple looks way to young to be married there, oh wait, SHE WAS! Ha ha, she WAS too young. and I love these photos of Hema. Memsaab–Why such a dreadful one of RK??!!! when he could look like this!!!! 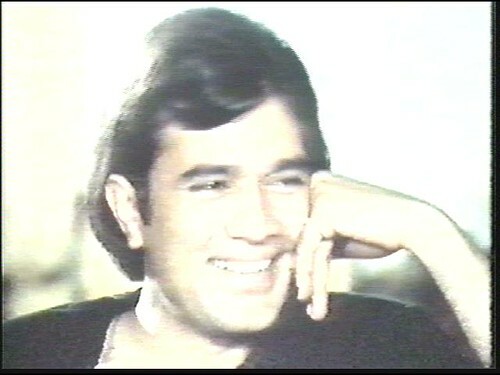 This is a screencap from the 1973 BBC documentary on RK “Bombay Superstar” (courtesy: one of RK’s fans from the RK forum). Hey, it was the only one of him in the magazine! And I don’t think it’s so bad.